I. Subgen. Platycarpos (S.Wats.) Kurl. 1989, Bull. N.I. Vavilov Inst. Plant Industry 193:24. - §2. PLATYCARPOS S.Wats. 1873, Proc. Amer. Acad. Arts Sci. 8:522; B. Platycarpos Aschers. et Graebn. 1907, Mitteleurop. Fl. 6,2:232; §1. LUPINUS S.Wats. 1873, l.c. :518, p.max.p. ; A. Eulupinus Aschers. et Graebn. 1907, l.c. :221, p.p. 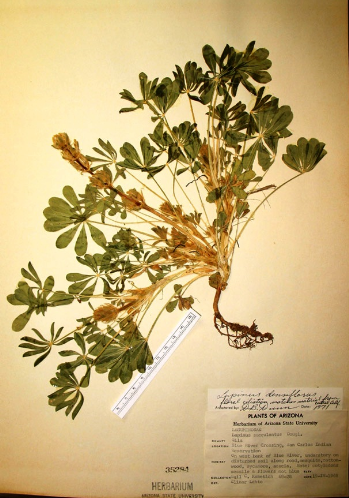 – New World’s or flat-fruited lupins. The ovary contains two and more ovules or seedbuds. The seed are predominantly small-sized, with an underdeveloped embryo and small amount of endosperm. Cotyledons are small-sized, with long caulicles. The first pair of true leaves is alternate. The stem is predominantly naked with waxen coating. Dominating is the monopodial type of branching. Leaflets are smooth, with waxen coating or slight pubescence, predominantly narrow. Pods are flat or orbicular, with two or more seeds. This subgenus includes several hundreds of species (from 100 up to 1000) requiring further analysis of their authenticity! II. Subgen. Lupinus. 1989, Bull. N.I. Vavilov Inst. Plant Industry 193:23. - A. Eulupinus Aschers. et Graebn. 1907, Mitteleurop. Fl. 6,2:221, p.min.p. - Old World’s lupins. The ovary has at least four or more ovules or seedbuds. The seed are predominantly large, with the well-developed embryo, without endosperm. Cotyledons are large, with a short caulicles. The first pair of true leaves is opposite. The stem is always pubescent; dominating type of branching is sympodial. Leaflets are pubescent to different extent; they are predominantly broad, and only one species (L.angustifolius L.) has narrow leaflets. Pods are orbicular, with four and more seeds. 12. L. somaliensis Baker, 1895, Bull. Roy. Gard. Kew, 105:213. 2. Lower flowers of inflorescence alternate. 4. Leaflets linear; lower lip of calyx entire to slightly 3-toothed; seeds round; plant sparsely sericeous. ..........2. L. angustifolins L.
4. Leaflets short and broad; lower lip of calyx deeply 3-toothed; seeds lenticular or compressed, brownish; plant coarsely hirsute. ..........3. L. micranthus Guss. 5. Flowers golden yellow, scented; upper surface of leaflets villous. ....4. L. luteus L.
5. Flowers cream to mauve, not scented; upper surface of leaflets ± glabrous. .........5. L. hispanicus Boiss. and Reut. 6. 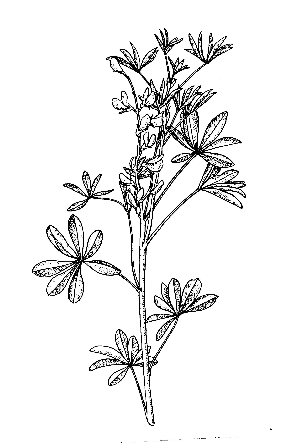 Hairs on stems < or =" 1" or =" 1/3"> 1 mm; lower lip of calyx entire. 7. Lower lip of calyx shallowly 3-toothed; tip of keep blunt, pigmented blue; seeds about 8x6x3 mm, brown or grayish with blackish markings. ………6. L. cosentinii Guss. 7. Lower lip of calyx ± entire; tip of keel pointed, not pigmented blue. 8. Pods 9-12 mm broad; seeds about 7x6x3 mm, mottled reddish brown with a smooth hump overt he hilum. ………7. L. digitatus Forsk. 6. Hairs on stem > 1 mm; lower lip of calyx entire. 9. Hairs on stem 3-4 mm; pedicel > or = 1/2 length of calyx, lax. 10. Flowers very large, deep blue (rarely pink) with a white band up the centre of the standard; leaflets softly villous; seeds 10-14 x 9-12 x 6- 8 mm, mottled brownish red; plants erect. ........9. L. pilosus Murr. 10. Flowers pale yellow to pale pink, tinged with blue; leaflets sericeous; seeds slightly smaller than 9, mottled brown; plants rosetted. .....10. L. palaestinus Boiss. 9. Hairs on stem 1-2 mm; pedicel 1/2 length of calux, rigid. 11. Leaflets sericeous; pedicel; standard with a central white band, broadening towards the upper margin; seeds about 8-11 x 6-8 x 5 mm, mottled brown to pinkish brown with a smooth hump over the hilum. ...........11. L. atlanticus Gladstones.